It’s been a while since I worked on a blog post that didn’t involve some good food or the wonderful properties I’ve checked out in recent times. With so much happening since the past few weeks, I decided to finally make some time for myself. For those who know me, spa sessions are one of my biggest weaknesses. Any place I go, no matter where in the world, I won’t come back without having experienced and pampered myself at a spa. The more local, the better… because trying out new experiences is what life is truly about! This time, I went to Shen Reflexology. They’ve been around in Mumbai for a while now but surprisingly I learnt of them very recently. With just one exclusive outlet in Khar, I was pleasantly surprised to have come across this hidden gem. One can’t deny the presence of so many Thai spa outlets in the city, there’s definitely a high demand for relaxation and rejuvenation therapies. Most of us are living in the fast lane and lead a high pressure urban lifestyle. With way too much on our minds and zero time to take care of our health, sometimes all you need is some de-stress time to yourself. 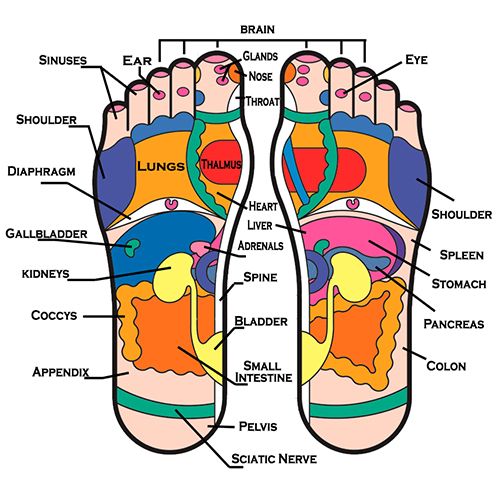 So what’s so different about “reflexology” as a therapy? It’s a holistic therapy that works on the hands and feet to restore the balance within the whole body. Here, our hands and feet are like mini-maps of the whole body, so that the entire body can be stimulated by applying pressure to various reflex points. The aim is to stimulate the body’s own healing process in order to keep it in balance. Relieves stress + tension and has a deep relaxing effect (more than 75% of disease is estimated to be stress related). Improves blood circulation consequently increasing the efficiency of overall body functions. Improves waste and toxin removal and elimination. Helps release trapped nervous energy and improves neural efficiency; more than 7000 nerves are stimulated during a Reflexology session. Activates the body’s self healing. Shen in Chinese philosophy is one of the basic substances that pervade the body, usually translated ‘spirit’, encompassing both the mind of the individual and healthy mental and physical function. As quoted by renowned reflexologist, Valerie Demery, ‘Reflexology is a journey through the sole to the soul’. Right from the moment I arrived, Ms. Shweta Nadkarni – the founder of Shen Reflexology was there to assist and guide me through the various therapies on offer. I decided to go in for the 60 minutes hand and foot reflexology session. With 30 minutes allotted to each, there was no reason to not look forward to this time. A quick change into a super comfy pair of 3/4th pants and I was ready to settle into the reclining armchairs. A dedicated therapist for every client and multiple alternative therapies to check out, the place exudes calmness and the soothing light only makes the experience a lot more welcoming. Designed as per Zen interiors, the sound of running water keeps you company and the music too has a calming effect that simply helps you unwind. All hand and foot therapies begin with an invigorating soak with a special mix of Dead Sea salts and essential oils. 60 minutes of sheer bliss later, my therapist knew what he was doing and I came out feeling more relaxed than ever. Although the therapy was concentrated on working on my reflex points (hands + feet), you also get a quick and basic head, back and shoulder massage. Now who doesn’t love a little more than what is promised, right? Like every other spa session, one can enjoy a cup of fresh and aromatic herbal tea soon after it’s over and there’s really no better way to end this feeling. Very reasonably priced than most other spas in the city, my 60 minutes’ hand and foot combo therapy is priced at Rs. 950 (inclusive of all taxes). Sounds like something you could invest in once in a while, right? To learn more about the other therapies offered, check here. PS. The blogger was invited to check out Shen Reflexology.